Enamel is made by fusing powdered glass to an underlying substance or layer by firing at a temperature between 750 – 850°C. The powder melts and then hardens to a smooth, glassy coating. Enamel has been used within art and … for centuries, found on many ancient civilisation artefacts. It is a remarkably durable material and luckily for us, this stunning dial has withstood the test of time. 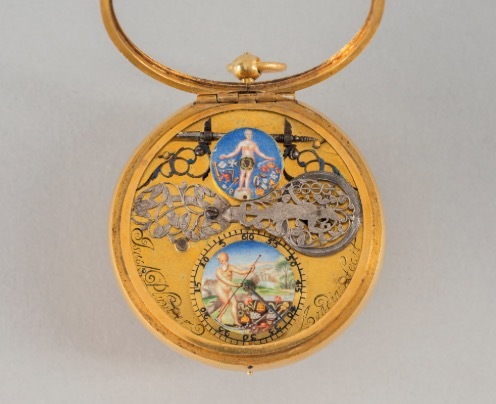 This is one of the earliest painted watch dials, also boasting a seconds’ dial. During this period, longcase clocks were easily able to have a seconds’ dial by using a seconds’ swinging pendulum and an extension through the dial plate of the anchor escapement arbor for the second hand. Therefore, to provide a second hand on a watch was a revolutionary unique selling point! The scene on the dial shows a flying Cupid and a reclining Venus. Whilst this is a recurrent classical painting theme, it does not appear to be a copy of any artist in particular and so perhaps Pluvier was not only a highly skilled watchmaker, but also an artist? The bounteous lady on the rate adjustment cover is presenting the World’s abundance. Father Time (the anthropomorphised depiction of time) is shown in the seconds dial, taking worldly goods away with him across the River Styx. In Greek Mythology, the Styx formed the boundary between Earth and Underworld, Hades. To reach Hades, the deceased must pay a fee to the ferryman, Charon. Although Dutch, Pluvier was appointed as journeyman to a Mr Bouquett of the Clockmakers’ Company in 1637 and between 1652 and 1665, became a Freeman of the Company. The Clockmakers’ Company were granted a Charter by Charles I on 22nd August 1631, which gave the Clockmakers’ power to govern the horological trade in both the City of London and for a radius of ten miles around. You will be able to see this stunning watch at the forthcoming Innovation & Collaboration exhibition at Bonhams from September 3-14 2018.